Rich internet applications become more popular and powerful every year, but they have been limited to what can be done from within a web browser. Adobe AIR allows web developers to leverage their Flash, Flex, HTML, and AJAX skills to create multi-platform desktop applications. In AIR for Flash Developers, David Tucker uses Flash CS3 Professional to create several AIR applications, exploring the workflow and features of the AIR extension and runtime along the way. He discusses how to integrate with an operating system; how to incorporate HTML and PDFs; how to use the local SQLite database for information; how to package, distribute, and update AIR applications; and much more. Example files accompany the course. I know David and I'm sure he made a wonderful job. AIR for Flex Developers is David Gassner's follow-up to his AIR Essential Training course, and takes a deeper look at how Flex Builder 3 and the Flex 3 framework can be used to build cross-system desktop applications with Adobe AIR. David examines every point of integration with the host operating system, including working with the local file system, creating and maintaining local databases, and managing native windows and menus. He also shares tips for how to configure the development environment, and how to publish and update finished AIR applications. Example files accompany the course. In AIR Essential Training, instructor David Gassner shows how to use the Adobe Integrated Runtime (AIR) and associated development tools to create dynamic applications. David demonstrates how to build and deploy desktop applications that run equally well on Windows and Mac OS X. He covers creating applications in Flex Builder 3, Dreamweaver CS3, and Flash CS3; working with HTML and PDF documents; creating a seamless installation experience; and more. Exercise files accompany the course. Learn Flex in one week by going through this video training course. To maximize your learning, we recommend that you view the videos and complete the exercises in the order that they are listed. If you run into problems and have questions, you can ask a question on the Flex in a Week forum. The Flex development team has been very busy lately and last night they posted a ton of code and documentation on the next version of the Flex framework codenamed "Gumbo". "Gumbo" is the framework that will enable much richer application UI and break free of the more rigid look and feel of todays Flex applications. It is also the framework that will be powering applications made with "Thermo". I read that the Flex Builder 4 and the Flex 4 SDK are planned for the second half of 2009 but a nightly Flex 4 public alpha can be downloaded. But what I’m most worried about is how we can expose valuable data from Flex (and Flash) to search engines in a way that makes the user experience better. So I’m starting a contest in the hopes that the community can learn the best way to expose data from a Flex application to search engines. “Fleximagically Searchable” must be dynamically loaded. It can’t be static text inside of your application. - But I don’t care how you load it, in fact that might make a difference in how Google ranks you. The first link must be deep linked directly into where you load “Fleximagically Searchable” into your application. Feel free to use any deep linking methods out there. Read the full article on Ryan's site. The path to get the Adobe Certified Instructor (ACI) certification was a long process but now I'm done. So in a few time we'll schedule these official Flex 3 courses that they'll add to the Comtaste's Flex, Livecyle Data Service and Blaze DS courses published. One of my favourite AIR features is the support of creating local database file using SQLite embedded engine. If you have SQL skills it'll be easy to storing persistent local data to your desktop application. You can use this feature to store application data, favourite users' configuration options, document-oriented application, to cache data and synch it with the network. If everything is ok the AIR SQLite database is created and opened. Now you're ready to create tables and populate it. But a cool thing about the open() or the asyncronous method openAsync() is that you can create an in-memory database passing a null value to the first parameter of these methods. It means that the database is created not in a database file on disk but it's a temporary database reference. So you can now create your SQL statements, define mechanism for executing multiple statements in a transaction, use the begin(), commit(), and rollback() methods without having a local file. At the end of your operations you'll decide if storing the database on the local client or sending it to your remote server ! 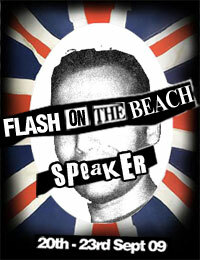 I was considering going myself at FlashOnTheBeach 2008, but now that they took me as a speaker I have no choice. I was an attendace of the first edition of the conference and I missed the two others. So I'm glad to be part of this awesome event. 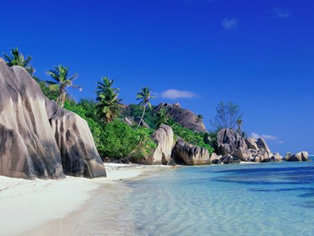 Moreover there'll be a lot of friends to meet and to party with. Looking at the lineup this is going to be great: Peter Elst, Koen de Weggheliere, Neil Webb, Lee Brimelow, Mike Downey, Richard Galvan,Ralph Hauwert, Keith Peters, Aral Balkan, Mario Klingemann, Branden Hall, Grant Skinner, Mike Chambers, Andre Michelle and many more. 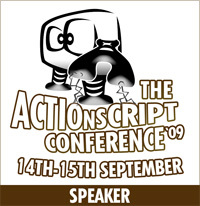 The FOTB08 schedule is now up, so don't miss to partecipate at this amazing conference ! Google has been developing a new algorithm for indexing textual content in Flash files of all kinds, from Flash menus, buttons and banners, to self-contained Flash websites. Recently, we've improved the performance of this Flash indexing algorithm by integrating Adobe's Flash Player technology. Now that we've launched our Flash indexing algorithm, web designers can expect improved visibility of their published Flash content, and you can expect to see better search results and snippets. There's more info on the Webmaster Central blog about the Searchable SWF integration. Adobe has published the SWF searchability FAQ on the Developer Connection Center.